At a meeting in 1930s, Gandhi convened India's independence movement leaders for a pivotal meeting. It wasn't a productive meeting. Polarities widened and rifts deepened as Sardar Vallabhbhai Patel (widely known as “Iron Man of India”) threatened to quit. No resolution emerged, but Gandhi left the meeting and quietly gave up salt from his diet. A month later, the same people found a common ground for cooperation. Its hard to say how Gandhi’s sacrifice of salt affected the outcome of that meeting, but Gandhi’s life offers repeated examples of how he believed his practices of inner transformation could create external impact. That’s a foreign technology for our modern world -- change yourself to change the world. Yet, its prevalent in almost all the social change giants of our time from Martin Luther King, Jr. to Dalai Lama to Cesar Chavez. Instead of activism, we call it giftivism. Giftivism is the practice of radically generous acts that change the world. Radical in its audacity to believe that inner and the outer are deeply inter-connected, and generous in its vision of uplifting 100%, the oppressor and the oppressed. 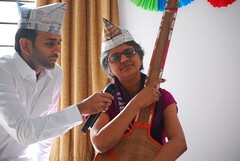 Last week, about 55 community organizers from around India met to deepen their understanding of Giftivism. I was one among them. The 3-day gathering anchored around 3 P’s -- practices for inner transformation, projects for external impact, and platforms for social change. And yet, there was no real agenda except to come together as “noble friends”. We started with an hour of silence followed by a few short stories. Siddharth opened. After getting his MBA, Siddharth used to give stock tips on CNBC every two weeks; after a shoot one day, the cameraman tells him, “Sir, what’s wrong?” “What do you mean?” he replies. “Sir, today, you were smiling.” It marked a turning point in his life as he quit his job and has now dedicated his life to service. “Today is my birthday,” he opened at our Giftivism retreat. Like every year, his mom asks him what he wants as his gift and like every year he was set to respond with “Nothing”. Yet, he noticed that his mom wasn’t feeling so good, so he said, “Mom, I want you to write me a list of 10 things you’re grateful for.” After some joyously awkward moments, he had his list. His mom was feeling so great, she made her staff at the hospital do it. Soon, everyone in the family did it. It went on FaceBook and friends offered 10 things they were grateful for. 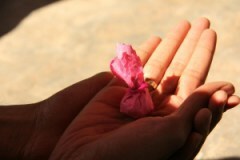 Siddharth’s wife decided that she’ll write her 10-grateful-things for the next 40 days. His Dad, his aunt, his sister in the US, and many others, joined in. It’s a gift of inner transformation. A gift that keeps on giving, as backed by neuroscience. Madhu went after him and shared how his neighbor got upset with his parking and smashed his entire windshield one day. He was furious and wanted to take a stone and smash his neighbor’s windshield too, but he held back, went home and tried to calm himself down. Aware of the spirit of Giftivism, he knew this was his time to practice. “I found a box of sweets and decided to take it to his house. To be honest, every cell of my body was saying no, but I knew I wanted to do it. It took me 15 minutes to walk those two flights of stairs,” Madhu said. The man of the house wasn’t home but his wife received the gift. Madhu didn’t say anything about the windshield. “If we suppress negativity, it hurts us; if we express negativity, it hurts others. There’s really only one solution – we must transform negativity.” About six weeks later, he received an envelope from that household with exact amount of money it takes to replace the windshield glass. No words were exchanged, although a lot more was transmitted. Few more stories were shared. Nisha shared a beautiful story of how she learned humility by observing a crow’s nest on her farm. All these stories are deeply inspiring, not because they’re extra-ordinary acts like Michael Jordan's dunks or Pavarotti's singing but rather because they're abundantly accessible to each of us through resources within us. Another speaker from Wall Street shared a story of how his boss (one of the wealthiest folks in the world) called him for his annual review and asked, “What do you want?” A blank check of sorts. And he responded, “I would like to request a minute of silence before every meeting.” “Huh?” “Yes.” “Sorry, that’s not possible.” In a context where people bill every three minutes, asking for sixty seconds of collective silence can seem like a tall order. Next day, however, the boss changes his mind and soon the office starts doing 2 minutes and then 3 minutes, and now they’re up to 30 minutes of meditation before each meeting. If all this happens in just an hour, imagine what three whole days together would be. Such a movement requires abundance of heroes, all connected as a family. And Urban Ashram community in Pune, who hosted this event, was a shining example of this. Outside the halls would flower 'rangoli', on the walls would be hand-calligraphed quotes, in front of our cushions and chairs would be hand-made diaries from one-sided paper. Lots of art. Someone even made a personalized air-freshener for our hall! Labor of love, powered by a community of everyday heroes. Every night of our gathering featured “Spirited Talks”, about people’s personal journeys. First up was Dipika, who spoke about her lessons from a farm life. “I started by trying to dominate nature, but now I practice becoming an instrument of nature,” the precocious 25-year-old said. Rather quietly, in just one sentence, she bowled everyone over: “People didn’t understand what I was trying to do, until I got an international award once.” Why did she get an award? She had planted a million trees. Yes, million. Not only did others understand, but her own father was inspired (over time) to sell his hospital and become a full-time farmer and an advocate of natural healing. Dipika incidentally had never given a public talk before. This was the first time she got an opportunity to share her story. The problem isn’t that we don’t have forums for everyday (or young) heroes, but rather that we have eroded the social bonds and trust networks that help us discover these heroes. Whenever we do find them, we strip them of their everyday-ness and centralize their heroic-ness and turn them into celebrities. Such thinking goes against the Gandhi 3.0 vision and all the folks at this retreat were certainly attuned into that trap. Stunned by irony of that moment, she embarked on a process of transformation that led to her cutting down her hair, dropping use of makeup, quitting her job and starting a Kabir Festival in Bombay. “The only way to understand Kabir song is to sing them!” So she now sings them, as she did on various occasions in the retreat. Dipti also seems to have followed that advice. For the last seven years, Dipti had quit music altogether – despite being professionally trained since she was 4 years old. Until this retreat. She was spontaneously moved to sing amongst us, in a deeply enchanting voice that felt like it was coming from another dimension of life. Even when our sessions were not in motion, the ripples ensued. In fact, it wasn’t even limited to just the people we knew. On the very campus where we were hosted, people started having tagging others with acts of kindness. “Who are you guys?” “We are just a group of friends who are ‘moved by love’.” “So what do you do?” “We practice generosity.” “You mean you just give things?” Rather serendipitously, another participant just comes over and hands him a small hand-made gift. :) “We try to create circles where everyone pays forward. Like a restaurant, where your check reads zero because someone before you has paid for you and you have a chance to pay for the person after you.” Incidentally, one of the gentleman was so moved by the ensuing stories that he is now keen to open a Seva Café in Indore. That spirit of love was catching hold of the entire campus, so much so that a resident, world-renowned flutist also came in to share a beautiful track and spend a whole hour listening to us. Our knee-jerk reactions to questions is to provide answers. But actually, in such matters where we are already predisposed to an innate understanding, the skillful process is simply to hold space until the questions dissolve. Generosity is easier done than said. When we start deepening our insight into being-the-change, it starts to inspire us to action, unannounced. We saw this repeatedly at the retreat itself. A nineteen year old girl called up her Dad after the first day. “Dad, you know that business conflict we’ve been having with our extended family? I think it’s time for us to let it go. Let’s just gift the whole business away and take the higher road.” Initially, her father might’ve been wondering what has gotten into her daughter, :) but then he explained how that doesn’t make any practical sense. She pleaded passionately but to no avail. Next morning, somehow, her father thought about it and made a phone call – and gave away his entire company! The young girl, while describing this to the whole circle, was in tears … as were most others. It was one of those moments. Everyone came together to create a goody-bag with a few small gifts and a collective poem for the family, letting them to know that all 55 of us were part of their decision and we bow to courage in their hearts. Yogeshbhai, who runs a Naturopathic Center, heard about Yuka's work in Japan and immediately felt called to make a public commitment to do 7:00-7:30PM prayer at his center, every single day! ​Rakesh, who took a day off from work just to fill out the retreat form and reflect on his responses to our questions, wants to host Awakin gatherings in his basement. Neeti is thinking of not working part-time so she can give love with "no strings attached". Abha is visiting a nearby coffee shop to start a "Coffee on the Wall" experiment. Uma wants to create a platform for all gift-economy projects in the country. Some are doing a 30-day kindness challenge while others are doing 30-day gratitude challenge. 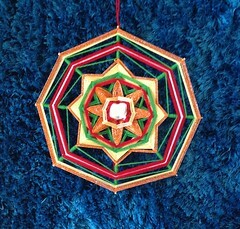 As Jagruti thought to step up her Wisdom Scroll art, Sheetal is working on creating a entire line of hand-made Wisdom Crafts. Jhanvi is looking to do a second version of Seva Cafe in Calcutta. Prem is thinking of doing 'Meals on Wheels' in Pune, while Srikanth is setting up a store for vegan food in Bangalore. Vaibhav wants to design Ek Titli to run on the three principles of ServiceSpace. So many adopted small practices of inner transformation, like meditation and daily acts of kindness, to bring this spirit into their daily lives. 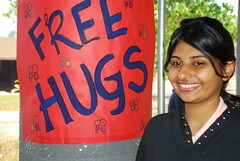 Another college student, Bhumi, had also called up her family before the first day was over. She was at the retreat because a Smile Card had changed her life. After some struggle, she paid the tab for a random couple at a coffee shop in Bombay, only to realize that they sat on the table right behind her. “I just did a small things, but for the next 20 minutes, I could hear their entire conversation about that Smile Cards, their ideas for paying it forward, and their renewed sense of hope,” she said. So she calls her Dad, Govind-bhai, after the first day and says, “Dad, I don’t know how to explain it, but you have to come here.” Her father, who happens to be a major industrialist, explained how he can’t just drive five hours while dropping all his pre-planned meetings. :) The next day she calls again and insists that he should come. Somehow, Govind-bhai made it. He had no context for what had unfolded, and was only there for the last half of the day. Yet he was profoundly shaken. The closing of the retreat started with a story of two monks, who embarked on a 3-step-and-a-bow peace pilgrimage for 900 miles across California. So we thought we’d do the same, at least for an hour, as an expression of our gratitude. It was optional, but everyone (including two elders in their 70s) participated. Outside our meeting hall was a wonderful circle, so we bowed around it, barefoot. The retreat center staff was probably in shock. As we closed, one of the participants (Neerad) takes a water hose and cleans our feet, as his gesture of appreciation. Another volunteer (Sheetal) joins in. Until, Govind-bhai and Bhumi come to pass the line. Govind-bhai puts his hands on Sheetal and says, “Son, please allow me to do this.” As Sheetal remembers it, “I wasn’t going to let anyone take away that opportunity but he said it so profoundly, yet gently, that I almost involuntarily gave it to him.” His daughter, Bhumi, took Neerad’s role and they humbly washed the feet of the approaching pilgrims. Ripples were set in motion. Maybe tidal waves too. All of us felt like a giant family that was moved by love. One participant sincerely remarked, "I learned more about myself in these 3 days than I did through my entire education at Harvard." Prior to the gathering, a friend in the US heard about the kind of people that were assembling in the spirit of service, and felt moved to make a contribution to the collective. Instead of a few people figuring out what to do with the offering, the money was distributed evenly to everyone at the retreat. So, at the very end, we all got an envelope titled "Small is Beautiful", with the idea of spreading this love in our local communities. The spirit of giftivism ripples on. Khushmita Sanghvi, one of the conveners of the events, shared this comment: "There comes a time when a space of love, so powerful is created, that every heart melts and the floodgates of deep inner emotions flows like a magical stream within a sacred circle of noble friends. My heart is filled with gratitude for all the noble friends who held that space in ‘Giftivism' retreat for the last 3 days. Love, laughter, silence, compassion and tears of gratitude flowed effortlessly within this circle and created a stream of ripples touching so many hearts. In eternal gratitude for this gift." Thank you for sharing this Nipun. I was struggling to capture the spirit of the retreat in words. We were completely Rocked by Love. Khush and I were there for the retreat, and yet just reading this recap, our jaws fell to the floor 20 minutes ago and still haven't yet come back up. :) We will cherish this, and all magical ripples from our retreat forever... and truly, if i have to drop dead today, I will die a happy man. Thank you, thank you, thank you. Thanks a lot Nipun bhai. I was finding it so difficult to explain my experience to others. This article captures the essence soo well. I still haven't got over the experience and have been smiling since then. Just cant stop thanking all the people who made it happen. Shukria for sharing Nipun!! For a while I have been wondering how I can incorporate generosity in my daily life. It is easy to write a check but it is not so easy to reach out to strangers and share with them. After reading this I have decided to start with small random acts of generosity and see where they take me. Thank you for taking the time to write and share this. It is so inspiring to hear about the tremendous impact of the SS activities and gatherings in India. I really enjoyed reading about the 3 P's and the anecdotes as they centered on these concepts. The ideas presented by some of the folks who shared were also powerful and I can already see where I might be able to integrate them into things I'm already doing. Phenomenal write up Nipun uncle!! My words always fail to express the work that you all do, express feelings and lead the life. Thank you soo much for everything :)) and I can't be thankful enough to be part of the lovely retreat and at the same time being able to meet you all. So moved to be with all of you! As was noted, my mother shed tears after 40 years. Here's the full experience that she shared: Transcending to Oneness. Great stories! Will surely use the ’10 things you are grateful for’ when people ask me what birthday gift do I want’. Was also moved by the ‘Cup of Coffee on the Wall’ (in Delhi where I'm based). Will convince my restaurateur friend to start it. We have grown to understand that we dont get to choose our relatives. So wrong this is! Because when I met all of you, I realised that each one of us can become every relationship rolled into one -- brother, friend, father, soulmate -- for every person we come across in life. Its silly to categorise and narrow our scope :), but we probably do it to reduce our responsibility to the other person, and end up losing out on the joy of connecting. Anyhow, when we started the Gratitude Bows (I was right behind Nipun and Guri) the first few steps itself were a defining moment of my life! Thank you, all! I wasn't even at the retreat but after reading this, after visualizing to whatever extent I could what you all experienced during those three days as if I were a participant myself, I am moved by love across the oceans to pay-it-inward and pay-it forward. Thank you all for being the change!!! On to Gandhi 3.0!!!! Feel very blessed to be a part of this beautiful family who moved me completely by love as rightly said, Love is all we need. Thank you Nipun bhai and each one for just being there. Deeply grateful for sharing this Nipun...It was one of the most beautiful times of my life where I felt encircled by love, enough to bring down the walls of my heart and yet feel protected. Thank you for this beautiful recap...it's a rewind to that energy, that space that made us feel 'designed for love'. Wow...I'm simply floored after reading this...I was just telling my parents about Service Space the other night and my dad asked me, "What does Nipun speak about when he is invited to conferences?" I couldn't really find an answer other than love, trust, and generosity and at the time, my answer seemed so small. But after reading this, I'm challenging myself to practice radical love with my parents, even when they frustrate me...as Madhu said, we can only transform negative energy, not suppress it. Dipika shares a straight from the heart talk in this video as part of the amazing Spirited series.. 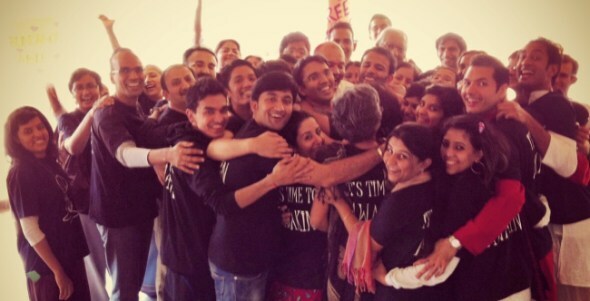 The Pune retreat felt like i found a 'family'. Now, being someone who typically shies away from large groups or verbal sharing in such a midst, i have to say, this felt different. And i attribute this squarely upon the summational intensity of all the love from the positive souls and energies that congregated at the Urban Ashram. About sharing, it's not that i am cynical of it, or that i don't perceive its intrinsic value. I simply never engaged in talking about something that can be done. I suppose, i dream of a world where acting would obviate the need for speaking; a world where my perception of someone's need is not based on visible markers or material indicators, a world where giving and receiving is in such a healthy, harmonious abundance it is not spoken of, because it is a normal [...] See full comment. The Pune retreat felt like i found a 'family'. Now, being someone who typically shies away from large groups or verbal sharing in such a midst, i have to say, this felt different. And i attribute this squarely upon the summational intensity of all the love from the positive souls and energies that congregated at the Urban Ashram. About sharing, it's not that i am cynical of it, or that i don't perceive its intrinsic value. I simply never engaged in talking about something that can be done. I suppose, i dream of a world where acting would obviate the need for speaking; a world where my perception of someone's need is not based on visible markers or material indicators, a world where giving and receiving is in such a healthy, harmonious abundance it is not spoken of, because it is a normal regimen of living and breathing. I chatted about this with Nipun over breakfast one day, referring to Ramana's [Maharishi] way, the succinctness of whose teachings i find to be the shortest path to realization. Nipun then said, "Yes, Ramana can be super direct. He can point us straight to the destination. But all of us do need these paths and explanations, too." Those words reiterated within me an important realization: it's not enough to practice acts of love however exalting and well-meaning they may be. It's important to participate wholeheartedly in the actions that sustain it. These little actions may seem superfluous or time-consuming but the energies and time are well spent for they prop up the nexus of love and mass-scale inner transformation. All of this, for some reason, brought my attention to the significance of the little actions, like, the kind gestures, the undertones of spoken words, a loving touch, a graceful nod and such. To put this idea across in metaphorical form, i'd say, "Sure the words make the difference but the tone of voice is how it does that." And it's in this regard that the retreat held much for me, and i'll share a couple instances of these seemingly 'tiny' deeds. Of the several gifts that we all received, one was a little sachet of chocolate balls. And with it was a handwritten note that listed out the ingredients. To me, this note was sweeter than the chocolate itself. You see, someone thought it necessary to include it, observing that it might be important for the recipient to know. And for me -- a vegan -- it WAS important. And what's more, the chocolate was indeed vegan! On the final day, we all received the 'Small is beautiful' envelope with Alissa's gift. As if the generosity of this gift wasn't humbling enough, there was a little 'heart symbol' hand drawn on the INSIDE of the envelope. Such a sweet touch! Again, someone thought, this tiny reminder of love had its place at that point of opening the envelope so it sets the tone for us to graciously receive its contents. There's more of course but i'll let this insightful quote from Johann Wolfgang von Goethe sum it up - "Character, in great and little things, means carrying through what you feel able to do." Hide full comment. This is a very interesting article. Thank you, Nipun-dada.